Old timers that used to fish grouper off Rocky Point when San Pedro was a big fishing port say that back in the day, sightings of tiger sharks 20 foot and larger where not uncommon. Outside the Reef:Black fin tuna are outside the reef in large schools, Dolphin are still being caught along with black snapper, yellow eyed red snapper and barracuda. Inside the reef:Mutton snapper, silver snapper and porgy are all being caught. Flats: Bone fish permit and barracuda are thick. Love or hate them sharks can provide unexpected and often unwanted excitement on any offshore fishing adventure. This is especially true off Rocky Point where some days the sharks are so thick that practically every fish you hook is nothing more than a head when landed. 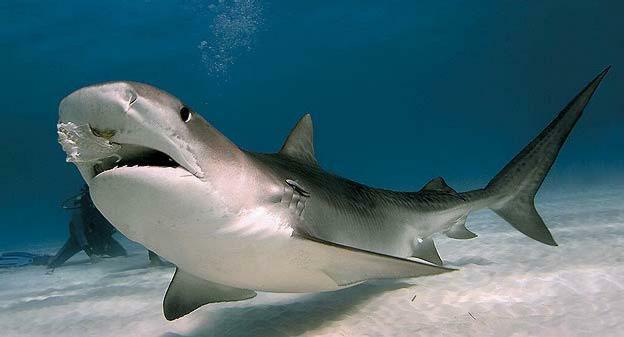 The species I come across at Rocky Point are the bull shark, the reef shark and the lemon shark. Rarely will I find tiger sharks. About three weeks ago I was fishing with SterlingVorus and Bill Vorus off Rocky Point in 400 feet of water when Sterling hooked a large shark. You can tell a shark long before it reaches the surface by the fight it puts up. Just one constant and hard pull; it’s like hooking a dump truck. I’ve had sharks on for six hours only to be cut loose because it was getting dark and time to go home. He fought the shark for about an hour at a quarter. We had it near the surface and could see it about twenty feet out. 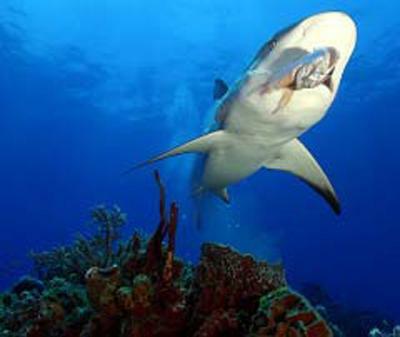 The shark was an 8 foot reef shark and he appeared on the verge of giving up when all of a sudden there was a strong jerk then the line broke. Looking down you could see a huge black shadow rapidly circle the shark we had on the line, which was now in two bloody pieces slowly sinking to the bottom. Some monster had just bitten the 8 foot shark Sterling had on in half. I saw the huge shadow move under the boat towards the stern so I rushed to my transom and saw the monster: a tiger shark, swim out from right under the boat. Its head was enormous, it was as wide as my transom (about 5 feet) and it appeared to be as long as my boat. The famous line from the movie Jaws when Chief Brody muttered, “I think we are going to need a bigger boat,” came to mind. I guessed it to be a tiger shark because of its size but I can’t be sure because it moved through too fast for me to ID it. Since then, I’ve told this story to several of the old timers that used to fish grouper off Rocky Point when San Pedro was a big fishing port and they told me that back in the day sightings of tiger sharks 20 foot and larger where not uncommon. To me, the shark was a disruption from what turned into a really good day for grouper fishing but I have to admit a disruption worth the time because it added a dimension of high excitement and possible extreme danger that only a shark of that unnatural size provides to an average offshore fishing outing. Captain Dilzon Murcia is the project manager for Island Ferry and owner operator of Dilzon Charters, a sport fishing charter business. To catch the fish featured this week, and other large fish, call Dilzon at 620-6118 or drop by the Island Ferry office and schedule your next fishing adventure.